C: The Front Desk Personnel are authorised to ensure that all visitors enter the Club in accordance with the requirements of the licensing laws. A: When required by a Club officer, proof of age must be established (being passport, drivers licence or photo card). C: Persons under the age of eighteen must be accompanied by a parent or guardian. A: The Club Car Park is for members and authorised personnel, use only when visiting the premises. If a car is to be left in the car park, specific permission must be sought and granted by Management. B: Members are responsible for their cars and their contents. All care must be taken when parking in the car park. C: When leaving the car park, members and guests are requested to do so carefully and quietly. A: Under NSW Health Act 2000, all indoor areas are non-smoking. A: Membership subscriptions fall due each year on 1st July and are payable in advance from 1st December. B: Five year subscriptions are payable in advance and renewable on 1st July at the completion of the fifth year. New membership cards are available for collection from 1st December from Customer Service. 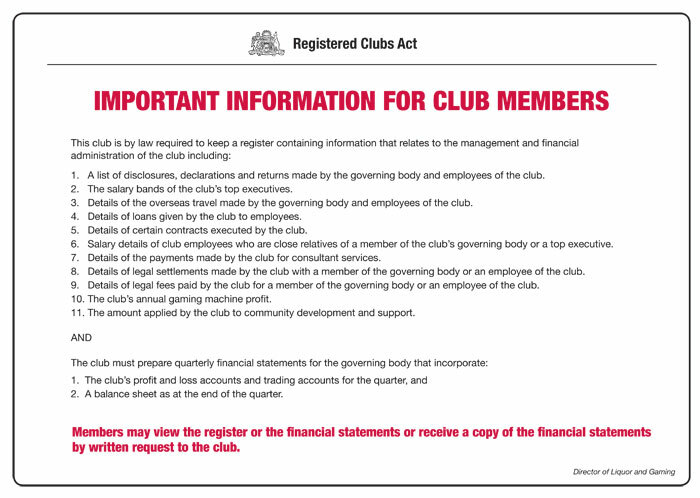 G: Without in any way limiting the meaning of misdemeanour where used in these House Rules members acknowledge misdemeanours include any action word, deed or behaviour of a member which may bring the Club into disrepute or cause the Club to have any recording made against the Club by any disciplinary, policing court regulatory authority.